Unemployment is falling. Interest rates are at historic lows. The stock markets are near record levels. Why talk about the next recession? Because as sure as you are reading this article, there will be a next recession. Now is the perfect time to talk about it – and more important – to prepare for it. The default human setting is procrastination. This is especially powerful when it comes to preparing for unpleasant events. After all, why bother preparing for something that hasn’t happened yet? But that’s really the point – you are in a much better position to prepare for difficulties when things are not all that difficult. In the calm of the moment, you can not only work with a clear head, but you most likely have the time and resources needed to make the right preparations. Carpe diem – seize the day. It’s why we prepare now for a retirement that is decades away, and why we have life insurance and health insurance just in case things don’t go the way we hope. It’s no different with economic conditions – there are recessions, and we can prepare for them. And there’s no better time to do it then when it seems unlikely to happen. The Great Depression aside, there have been more than a dozen recessions in the past 100 years. In fact, they seem to crop up about every 5 to 7 years. Ironically, it’s usually the periods of expansion that create the conditions that cause a recession in the first place. Interest rates are low, borrowing increases, businesses expand, stocks and property prices rise. At some point, the higher prices that come with expansions eventually create lower affordability. When it does, a recession hits. That’s when all the good stuff that comes with an expansion starts heading the other way. Money gets tight, jobs are lost – and that’s what we need to prepare for now. One of the complications with recessions is that each one is a little different. Some can be caused by high equity prices, others a tight labor market, and still others by rising interest rates. Conditions will be a little bit different based on whatever factors cause a recession first place. We can’t know exactly how a recession will play out, or what the greatest areas of stress will be, but there are general provisions we can make that are likely to help no matter how it unfolds. Avoid lifestyle inflation. One of problems with expansions is that we start getting comfortable with a higher standard of living. That’s a natural outcome – income is higher and we feel more secure about jobs. But it is precisely that increase in your standard of living that can cause the greatest amount of problems in an economic downturn. At a minimum, resist the temptation to expand your lifestyle. And where you can, cut back on as many extravagances as possible. The less money that you need to live on, the easier it will be to weather a recession. Be the best worker in your department or company. In good times, it’s easy to get a little bit lazy. You may not work so hard every day, and you may avoid opportunities to improve your skills. But once layoffs begin, how valuable you are to your employer could affect whether or not you keep your job in a recession. Work to be the best employee in your department or company, and take advantage of opportunities to improve your skills. That will also help to increase your market value just in case you are laid off. And it’s always better to do that before you need to. Pay down or pay off your debts. Like lifestyle inflation, people often take on debts during good times that they may not be able to carry when the economy turns down. Keep your new borrowings to a minimum, and work to pay down or payoff any existing loans that you have. A debt-free position could minimize the worst of the next recession. In addition to keeping your cost of living down, being debt-free can also give you options in a difficult situation. Build up your savings. A healthy savings account balance is one of the best protections during hard times. And it is much easier to build it up when times are good. If you wait to make this a priority, like when you lose your job, you’ll have no ability to do it. Start saving at least a little bit more money now, while you have the ability to do so. Like paying off debt, it can expand your options under more difficult circumstances. Enjoy the good times while they’re here, but start preparing for the rainy days ahead. You can bet that they’re coming, but what’s more important is that there is something you can do about it now. 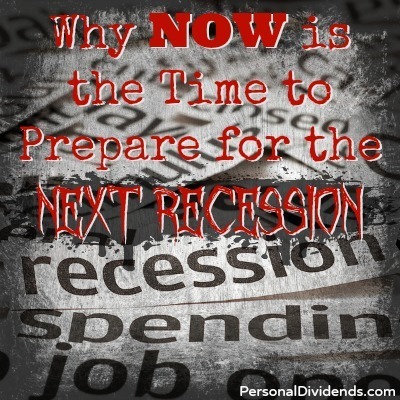 Are you making any preparations for the next recession?